Granite Shore Power consists of 1,069 MW of coal, gas, biomass, and oil-fired generation assets located in New Hampshire which sell capacity and electricity into the ISO New England wholesale electricity market. The Portfolio is comprised of five generation stations: Schiller, Newington, Merrimack, White Lake, and Lost Nation. Schiller Station, located in Portsmouth, NH, consists of a 43 MW biomass-fired steam turbine, two steam turbines totaling 94 MW capable of firing #6 fuel oil and coal, and an 18 MW oil-fired combustion turbine. Newington Station, located in Portsmouth, NH, consists of a 400 MW steam turbine capable of firing #6 fuel oil and natural gas. Merrimack Station, located in Bow, NH, consists of two coal-fired steam turbines totaling 448 MW and two oil-fired combustion turbines totaling 34 MW. White Lake and Lost Nation Stations, located in Tamworth, NH and Northumberland, NH, respectively, are unmanned, remote-start, oil-fired combustion turbines totaling 32 MW. Schiller Generation Station (“Schiller Station”) is located on approximately 81 acres along the western banks of the Piscataqua River in Portsmouth, New Hampshire, adjacent to Newington Station. Schiller station has two, dual fuel units capable of firing coal or fuel oil, a fuel oil fired combustion turbine, and a biomass boiler combining for a total output of 155 MW (winter capacity). The units serve mainly as peaking resources for the grid, with the exception of the biomass boiler, which operates as a baseload unit, producing renewable energy around the clock and providing vital grid stabilization energy for the New Hampshire Seacoast. Fortistar Biomass Group is a clean energy company with biomass generating assets and holdings in the U.S. and Canada. The Fortistar Biomass Group was formed in early 2008 with the acquisition of five biomass facilities. Its assets total 118 MW of installed capacity and are located in Michigan (Hillman Power Co., Grayling Generating Station and Genesee Power Station) and Alberta, Canada (Drayton Valley Power and Dapp Generating Station). These projects produce more than 65 MW of power – enough electricity to supply 65,000 homes. Forest2Market delivers project development and operational support to new and existing biopower projects by providing fuel supply diligence utilizing our proprietary market data. Our data is unique as it is the only comprehensive data that is collected at the transaction level; no survey data is incorporated. Annually, we capture millions of transactions at the truckload level including wood fuel pricing. At Forest2Market, we believe high-quality market information improves business performance. With our high-quality data, deep industry experience and third-party independence, we provide participants in the wood products and bioenergy, biofuel and biochemical supply chains with business solutions that support fact-based decision making and planning. Based on the quality and breadth of its proprietary market data, Forest2Market is recognized by project developers and the finance community as the premier provider of project support feedstock analytics. Forest2Market has conducted more than 300 analytical projects in support of traditional forest products industries, emerging biobased sectors, financial institutions and industrial organizations. Forest2Market is committed to promoting biopower as a key energy segment to reduce and mitigate the effects of climate change. As such, we also provide advocacy support for policy developments that drive change within global energy markets. EWP Renewable Corporation owns and maintains operations staff at the Fairhaven, Whitefield, and Springfield biomass plants. The Fairhaven biomass plant is an 18 MW generation facility located in northern California. Since operations began in 1987 the power generated is supplied to Pacific Gas & Electric under a long-term power purchase agreement. The plant uses over 250,000 tons of various forms of wood waste from local sawmills annually. Fairhaven is certified by the State of California as a renewable energy generator. The Whitefield biomass plant is a 16 MW generation facility located in northern New Hampshire. Operations began in 1988 and power is sold under a power purchase agreement. The plant consumes an average of 185,000 green tons of wood fuel per year sourced from numerous local suppliers. The plant’s successful environmental track record, modern pollution control equipment, and the installation of a regenerative scrubber system to lower NOx and an overfire air system to lower CO all contributed to Whitefield’s recent qualification as a Connecticut Class I Renewable Energy Credit (“REC”) producer. Steam is produced by a 180,000 pound Babcock and Wilcox fixed grate boiler which powers a Westinghouse turbine/generator. Located in western New Hampshire the Springfield biomass plant is a 16 MW generation facility that began operations in 1987. With several biomass fuel suppliers in the area, the plant consumes an average of 195,000 green tons of wood fuel annually and sells its power under a power purchase agreement. Similar to the Whitefield plant also located in New Hampshire, S pringfield’s environmental success is upheld by state-of-the-art pollution control equipment, the recent installation of a polishing NOx scrubber system, and upgrades to the boiler/central systems; these measures all contributed to the Springfield plant’s recent qualification as a Connecticut Class I Renewable Energy Credit (“REC”) producer. 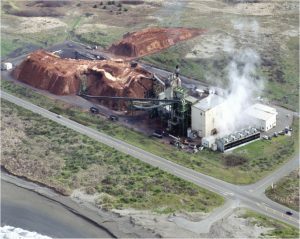 Evergreen Biopower is a 10-MW generating facility co-located with Freres Lumber Co. in Lyons, Oregon. The biomass energy facility, constructed in 2007, supplies steam to Freres Lumber plant processes as well as generates electricity for the local utility. Freres Lumber has operated for over 90 years as a family-owned business. Engie North America brings clean, safe, reliable energy to customers and communities in the United States, Mexico, and Canada. Engie North America’s acquisition of Canadian wind developer Ventus Energy Inc. in late 2007 helped launch the new business unit to further focus on growing the company’s renewables portfolio, which also already includes significant biomass, biogas and hydro assets. North American existing holdings and growth strategies in the sustainable development arena mirror the business model of Engie North America, a longtime global leader in using renewable energy sources to bring power to local communities. Nearly 40 percent of all of Engie North America’s electric generation capacity produces no carbon dioxide emissions, and another 40 percent produces very little. Ventus, incorporated in 2003, brings to Engie North America a portfolio of 25 wind energy development projects in six provinces in eastern Canada, including Ontario, Quebec, Nova Scotia, New Brunswick, Prince Edward Island, and Newfoundland and Labrador. The portfolio is believed to be one of the largest portfolios of potential wind energy projects in Canada and includes close to 2,000 MW of electricity generation in various stages of development. Through Ventus, Engie North America has secured land rights to more than 17 million acres of land for construction of its projects and has 29 MW commissioned and operating at the Norway Wind Park and West Cape Wind Energy Inc. facilities in Prince Edward Island. The company also has another 80 MW under construction at the West Cape facility and has received a further 99 MW of Power Purchase Agreements under the Ontario Power Authority’s Renewable Energy Standard Offer Contract Program, for which facility construction will commence soon. In addition to its interests in wind, Engie North America is North America’s third largest player in the biomass market segment of generating electricity from wood chips at seven plants in Massachusetts, Michigan, New Hampshire, Pennsylvania, and Vermont, and one biogas plant in Colorado. The company also operates a hydro power plant in Vermont. These biomass, biogas and hydro assets represent 137 MW. Also, five biopower generation facilities in North Carolina and Alabama use biomass and biogas resources to generate the steam and represent another 542,000 PPH or the equivalent of 54.2 MW. DTE Energy provides gas and electric utility services to millions of Southeast Michigan homes and businesses, and energy-related services to businesses and industries nationwide. In business since 1988 and headquartered in Ann Arbor, Mich., DTE Biomass Energy serves customers at more than 20 operating facilities across the United States. The company is a proven leader in the renewable energy sector. DTE Energy’s biomass energy division consists of landfill gas with more than 20 landfill recovery sites in 14 states. The company also runs a 20 MW wood-fired plant in Woodland, California, and is developing two others in Bakersfield and Stockton, California, which will bring its installed capacity total to about 100 MW. DTE Energy provides energy solutions to landfill owners and operators across the U.S., helping them adapt to and benefit from the increasing emphasis on renewable energy. The company acquires, builds, develops, owns, and operates landfill gas recovery systems, landfill gas-to-energy projects, and carbon offset projects providing environmentally sustainable products to the market. Turning harmful greenhouse gases into a renewable source of energy has helped DTE Energy recover more than 900 billion cubic feet of landfill gas to date, a positive environmental impact equivalent to planting more than 4.5 billion trees. 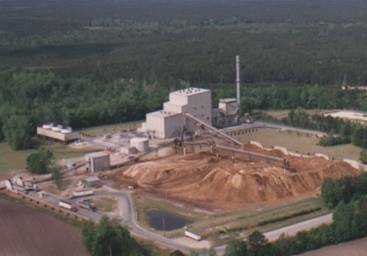 The Craven County Wood Energy (CCWE) facility is a biomass-fired power plant with a 50 MW nominal rating. The plant’s main source of fuel is wood waste provided through area manufacturing processes and managed forest initiatives. CCWE is an integral part of the community with millions of dollars invested annually through fuel procurement, equipment purchases, taxes, and salaries. CCWE is owned by a partnership of CMS Generation and Decker Energy. Covanta Energy is a subsidiary of Covanta Holding Corporation, an internationally recognized owner and operator of large-scale Energy-from-Waste and renewable energy projects, including eight biomass facilities. This renewable power is generated by utilizing wood fuel from a variety of sources including logging debris, logs from forest thinning, wood waste from lumber mills, highway right of way clearing, agricultural waste such as nut shells and fruit pits, and greenwaste collected from the communities we operate in. Fuel that is gathered in this way also contributes to a removal of accumulated fuel available on the forest floor and a reduction in wildfire potential. The use of this fuel and the greenwaste fuel also reduces the amount of open burning conducted in our communities which significantly reduces carbon monoxide smoke and particulates released by open burning. Owned and operated by Covanta Energy since 2007, Covanta Mendota Power is a 25 MW biomass circulating fluidized bed (CFB) boiler power plant located on 80 acres in an agricultural area of the Central Valley of California, approximately 40 miles west of Fresno, California. Receiving wood waste which is diverted from landfills and agricultural wood derived from whole orchard removal and miscellaneous agricultural residue generated in processing produce such as olives, almonds, prunes, peaches and many others Covanta Mendota processes 600 tons of biomass materials into energy each day. The facility, owned and operated by Covanta Energy since 2007, generates 25 megawatt hours of renewable electricity, while reducing the amount of material disposed of in landfills. The facility’s energy generation helps power 25,000 homes on a daily basis. Owned and operated by Covanta Energy since 1997, Covanta Pacific Oroville Power facility processes more than 500 tons of biomass waste materials each day. The wood waste materials are diverted from landfills and used as a fuel at the facility. Covanta Pacific Oroville Power also receives approximately 5,000 tons per year of agricultural greenwaste that contributes that helps the plant produce enough clean, renewable energy on a daily basis to generate approximately 16.5 megawatt hours (net) of electricity, the equivalent of powering 16,500 homes. Acquired by Covanta Energy in 2008, the West Enfield Power Station began commercial operation in November 1987. The facility takes wood waste from forest operations, thinnings and sawmills and combusts it in specially designed boilers to generate renewable energy. The wood waste is reduced to an inert ash residue that is approximately 3% of its original volume. The ash residue is can be used as fertilizer, soil amendment or bedding for farm animals. The facility processes The Covanta West Enfield Power Station processes 550 dry tons of biomass waste materials a day, producing 24.5 megawatt hours of electricity for ISO-New England, a regional transmission organization serving Maine, Connecticut, Massachusetts, New Hampshire, Rhode Island, and Vermont. Clariant is an international world leader in specialty chemicals based in Muttenz near Basel Switzerland. The Clariant group owns over 100 companies worldwide and employs 22,200+ people in 76 countries (1,680 in the US alone). In the financial year of 2013 Clariant produced a turnover of over 6 billion Swiss Francs. One of Clariant’s seven core business units develops and manufactures air purification catalyst for many applications, including reduction of CO (carbon monoxide) and VOCs from wood fired biomass applications. Depending on the nature of the wood feedstock and temperature of exhaust gas, CO reduction as high as 90% can be expected. Our Needham, Massachusetts facility contains one of our catalyst R & D and analysis labs, manufacturing, warehousing, and sales and administrative offices. From here we can provide a rapid response to technical and production needs. Clariant operates manufacturing facilities in Arizona, California, Georgia, Illinois, Kentucky, Louisiana, Maine, Massachusetts, Michigan, Minnesota, New Mexico, North Carolina, South Carolina, and Texas.